After years of making silent, stealth electric-powered side-by-side vehicles, Bad Boy was ready to make some noise. Their new gas-powered Stampede 900 4x4 (see Stampede campaign here) came from years of research and testing, and represented a new identity for Bad Boy — so we gave them a new brand to match. From the logo to the visual identity to the new aspirational tagline, Driven by the Bold, we put the powersports world on notice: something new had arrived, and it was Bad as hell. 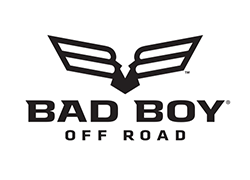 Bad Boy’s bird icon was designed to symbolize the freedom that off-road drivers enjoy in the brand’s vehicles, and it features two B’s in the wings as a nod to the brand name. A new color palette, textures, and graphical elements give Bad Boy a modern, rugged feel.